Smaller sensor: in place of the X100’s APS-C sensor the X10 has a tiny 2/3-inch EXR CMOS sensor. Interestingly, this sensor is still 2 times larger than the F600 EXR sensor. The X10’s results are really good for its category. It achieves scores close to 1/2 stop better than the Fuji F600. Its Color depth (20.5) and dynamic range (11.3 Evs) remain in the same range as the best camera in this segment (Canon Powershot G12 or PowerShot S100). On the other hand, the Nikon 1 cameras achieve a low-light ISO score of 372 – 2/3 stop better than the X10. As with every camera in this segment, the X10’s low-light ISO score remains low. But its performance is still interesting, and its bright lens should enable users to shoot nice photos. The two cameras are significantly different with respect to their sensors… and to their DxOMark scores. The X10’s sensor is 2 times larger, and its low-light ISO score close to 2/3 stop better, but it is also more expensive. The Nikon 1 takes the lead, particularly in terms of low-light ISO score. 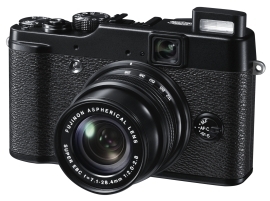 Among compact cameras, the Fuji X10 is definitely a good choice.